This Annamese child’s coat (pufu) is the only identified example of its kind to have survived. The kingdom of Annam was the southern-most province of the Chinese-Empire and is now part of Vietnam. Records show that the Chinese emperor gave a coat of 2nd rank to an emissary from the Annamese court in the late 1880s. 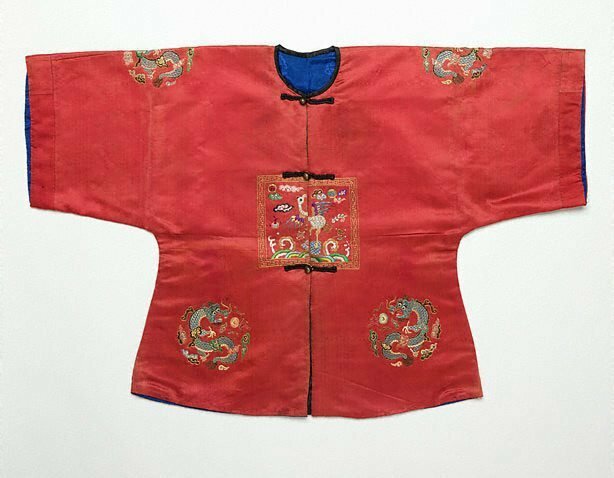 The coat is made of red silk with a rank badge on the front and back, each depicting the sun and the moon. It is further decorated by six roundels portraying dragons with flaming pearls. Peacock feathers have been used to detail clouds, the rooster’s tail, the ‘ruyi’ sceptre and dragon’s whiskers. Rank badges were introduced to Annam in 1744, when the king decided his officials should assume Chinese-style clothing. In 1806 a decree was issued asserting the type of birds and animals civil and military officials could wear. All rankings were one step behind the equivalent Chinese ranking system, so no one could be ranked as highly as the emperor. These rules stayed in place up until the French rule of Annam in the 1860s. The study of Annamese rank badges is still in its infancy because few badges, portraits and records have survived from this period. Some of the information that accompanies these silk pieces was recorded by a German Jesuit priest, Father Koffler, who lived in Hue in 1744 and was the king’s physician.